In a stand mixer bowl, add bread flour, gluten, sugar, salt, ghee and water – using the dough hook, mix gently until it starts to come together. Increase speed and continue until all ingredients are combined and your bowl is spotless. Remove from bowl and give it a good roll on the benchtop/wooden board- you’ll know it’s ready if it doesn’t stick to the surface. Divide dough into approx. 100g portions, about 8 balls. Using your pinky and thumb and your hand curved, roll each portion back and forth to get rid of any creases and until you achieve a perfect ball. Carefully place each ball into oil bath. Allow these to rest for 3 hours. Once rested take each ball and stretch it out by pressing it out onto the bench and slowly teasing it out by lifting and throwing it back onto it. 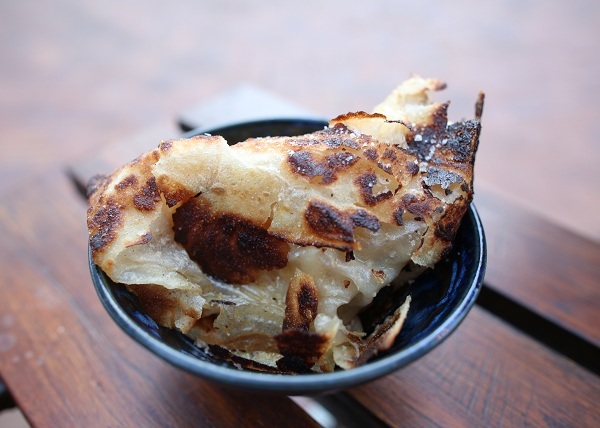 Continue until you see completely through the roti dough – this tells you it’s thin enough. Fold dough inwards into an envelope place onto baking paper if prepping in advance. Continue with each portion, stacking each envelope with baking paper in between. Keep in fridge until ready to serve. On a hot pan, drizzle olive oil and place roti dough onto the pan, face down. Peel baking paper off. Cook until golden brown, crisp and slightly charred. Flip after 2 minutes. When ready, clap it, stack it, salt it. Enjoy!